Via "Here in Red Hook"
“Here in Red Hook” is a photoblog run by South Brooklyn Community High School’s own Andy Vernon-Jones. It looks like the blog is coming to an end, but not before a final month of pictures. 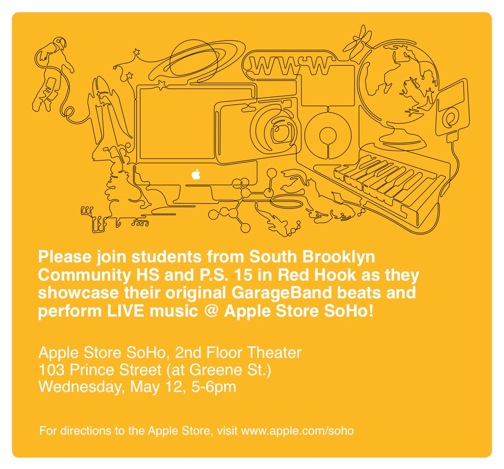 Check out students from Justin Wedes’s Digital Expressions music class, along with their collaborators from PS 15 in Red Hook, next Wednesday at the Apple Store in Soho. Students will be sharing their original beats and talking about the process of creating them. Special Guest- Percussionist, DTE Teaching Artist (and recent recipient of the nickname “The Godfather”) Angel Rodriguez. One of the classes Dance Theatre Etcetera teaching artists are working in this fall is a “Digital Expressions” class at the South Brooklyn Community High School in Red Hook. The class, led by teacher Justin Wedes & teaching artist Jive Poetic, gives students an introduction to computer & software literacy through project-based work from the students’ unique perspectives. The class recently made a trip to the Apple Store in SoHo for a little fun mixed with a little work as they showed off assignments from the class. Check out some of the pics from their visit (all photos: Wilfred Cameron). Visual artist Eduardo Rabel will begin teaching at two of DTE’s in-school programs in the fall, lending his talents to the South Brooklyn Community High School in Red Hook and a school founded on its model, the East Brooklyn Community High School in Canarsie. While his summer winds down, though, Eduardo isn’t just planning for the fall. 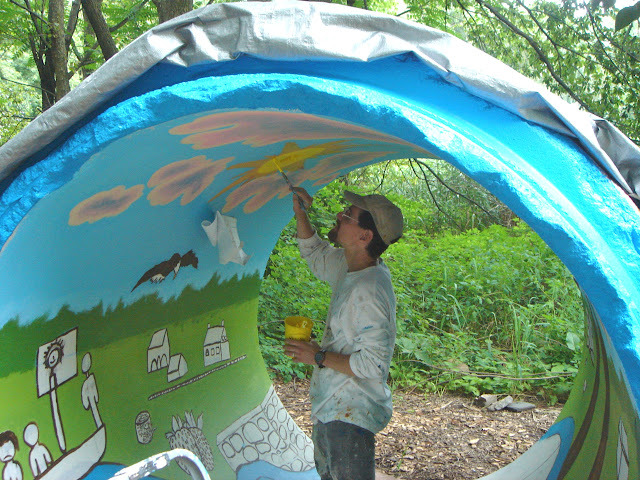 He recently sent us an update on a project he has in progress in Teaneck, NJ. Check out the Flickr stream to see the process unfold before your eyes. ER reports that the project is moving along nicely, but that they still need volunteers- YOU- to help finish up by the end of the month. They’ll be out there every day the sun shines except tomorrow (the 25th). If you’re interested in helping out on a cool project and getting paint on some old pants, leave a comment and we’ll hook you up with Eduardo. Dance Theatre Etcetera would like to congratulate all of the graduates from Brooklyn International High School, South Brooklyn Community High School, and all other graduating students who have worked with us. Way to go! Stay in touch! Students had a blast last Friday at Good Shepherd Services Creative After-School Adventures Program at P.S. 27 when Amayo’s Fu-Arkist-Ra performed. Amayo worked with the young people after the performance to create original beats and movement. Assistant facilitators from DTE and South Brooklyn Community High School kept an eye on things. Check out Amayo at the Red Hook Fest this June! Bob and TheaterWorks spent Friday working hard at DTE. They took a moment to pose with Martha and the dog.